Vegetable Soup – Create, Make & Bake! This vegetable soup is IBS friendly and vegetarian friendly, not the best tasting soup ever but it’s nice enough to eat. I also didn’t follow a recipe for this one, I mainly just made it up. 1. Melt the butter in a soup pan then add in the potato, carrots and celery. Cook for 5-8 minutes. 2. In a saucepan, put in the 1 1/2 L of water with the frozen vegetables and heat for about 5 minutes. 3. Add all of the water and vegetables to the to the soup pot and add the tomato puree. Add the salt and pepper. Stir well. 4. Turn the heat up and cook until the potatoes are soft enough to be easily stabbed with a rounded knife, about 10-15 minutes. 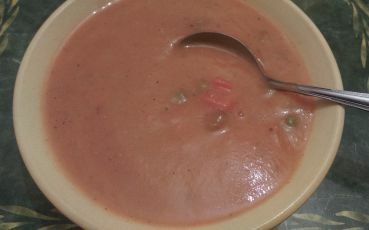 Leave to cool for a bit then blend about 1/3 of the soup with a blender and then mix together well. Done!